Employee management is not that easy. Human resources is required to observe due diligence and dedication to looking after the welfare and efficiency of the employees. When it comes to employee misconduct, there are certain protocol that the HR manager has to comply with. 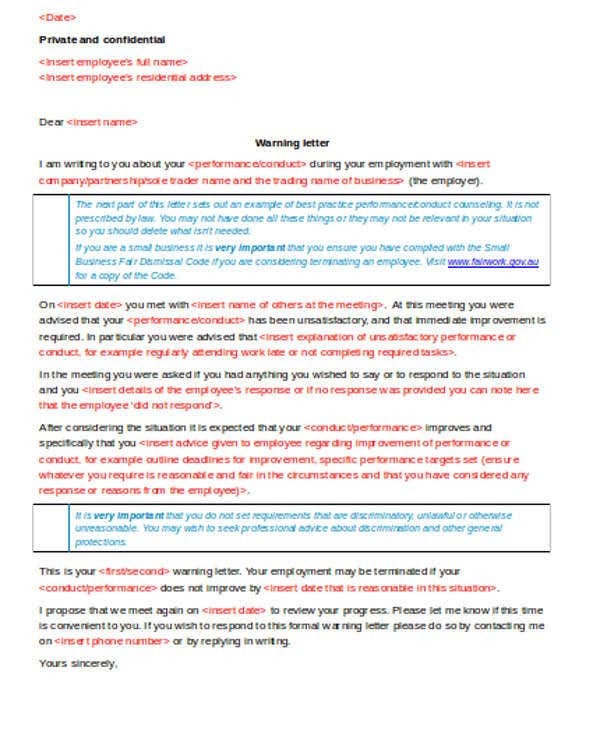 Although each employer has their own set of procedures, the prevailing practice and legal requirement in most countries is that a warning letter must first be given to the employee. 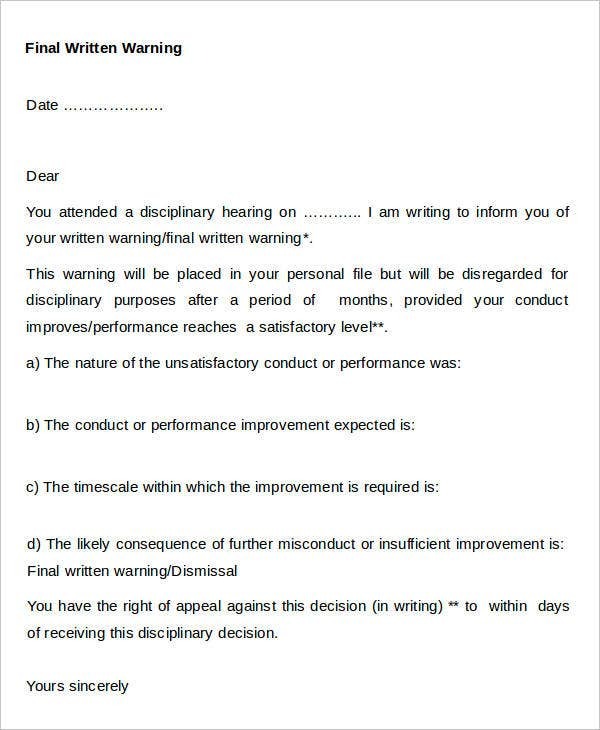 The warning letter serves as a notification on the employee’s end for him or her to understand the gravity of the offence committed. 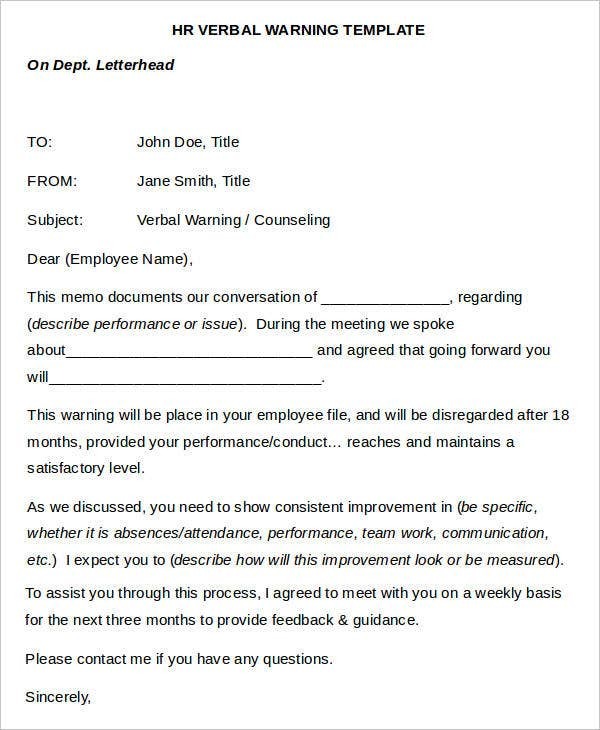 To help you write one, we have here 31+ warning letter templates you can use. Deliberate employee misconduct – In an employment setting, the employer forges an employee code of conduct outlining the various policies, rules, and procedures the employee must understand and comply with. 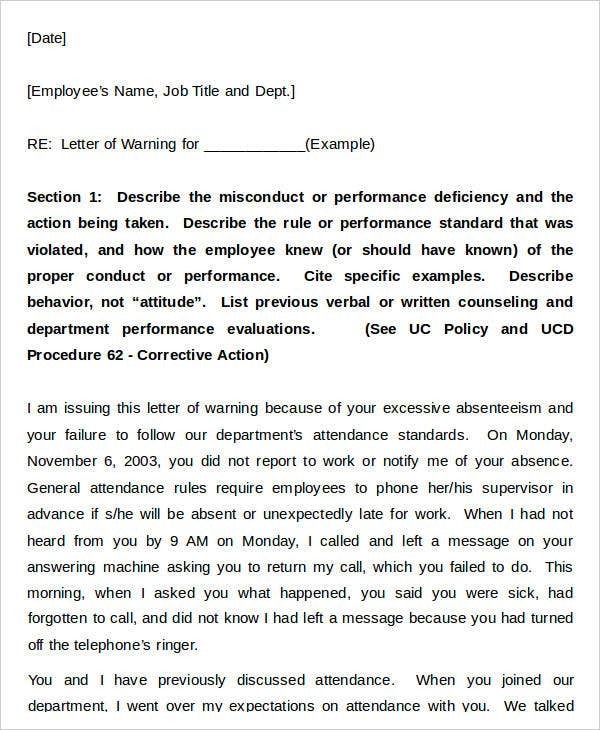 If the employee deliberately commits actions that will run afoul of the provisions of the employee code of conduct, then the HR manager has to give that employee warning letters. Unsatisfactory and poor performance – If the employee fails to meet the standards of the company after a series of coaching, training, and employee interventions, then such employee must be warned about such failure. Absenteeism – In pursuance to the employment contract, an employee is expected to satisfy the expected number of working days and hours. In this case, the employee regularly fails to attend and report to work without any just and valid reason. Any other acts of negligence and violations which must be subject to disciplinary action – Bear in mind that acts of negligence committed by an employee in the performance of his or her task can be detrimental to the employer’s end, specifically when it comes to client relations and productivity. 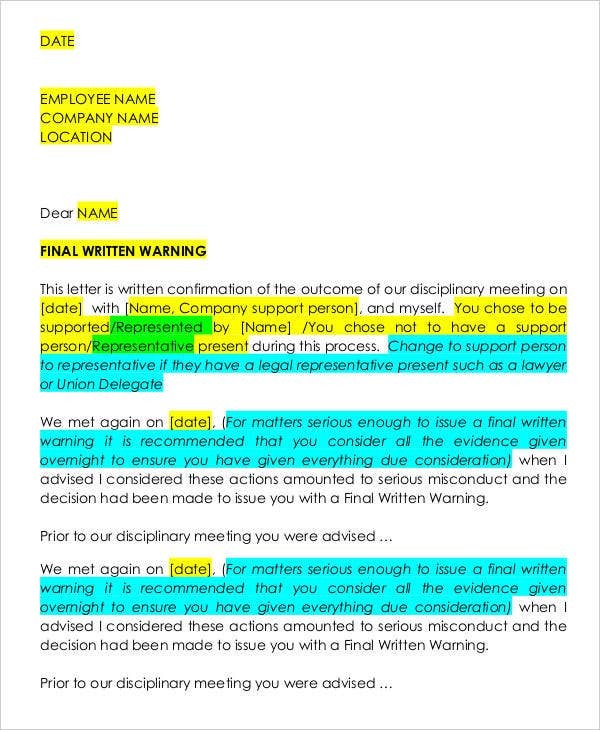 These are some relevant reasons why a warning letter is written. Furthermore, there can still be other subjective grounds provided by each employment contract. 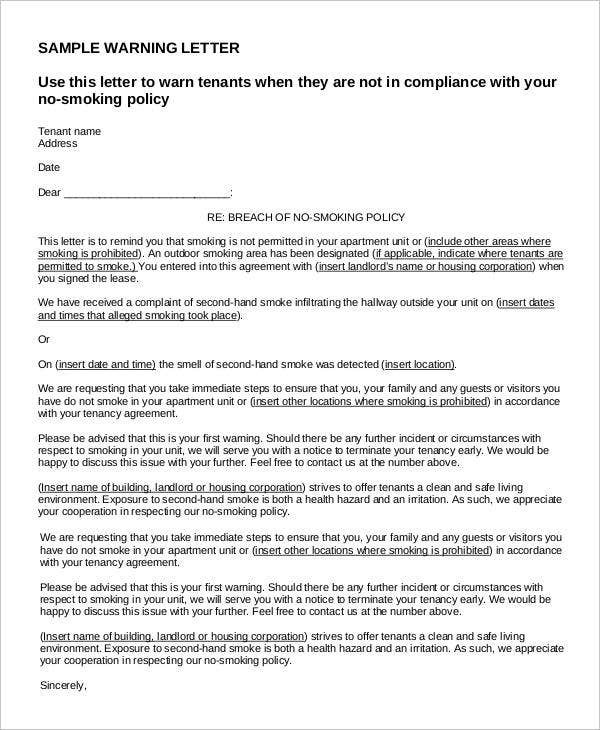 Bear in mind that a letter of warning, regardless of its nature, is considered as a formal letter. 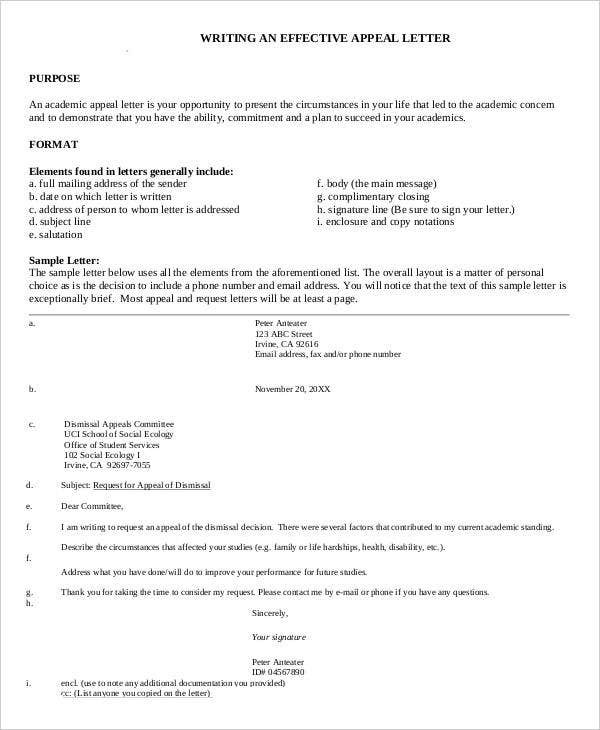 This means that you must follow the same formatting styles prescribe for a formal letter. The variation lies on the components and content of the letter. The contents may be subjective. However, there are common components observed by most employers. Violation – Clearly specify the violation committed by the employee. The type of violation itself provides the reason and thrust for the warning letter. 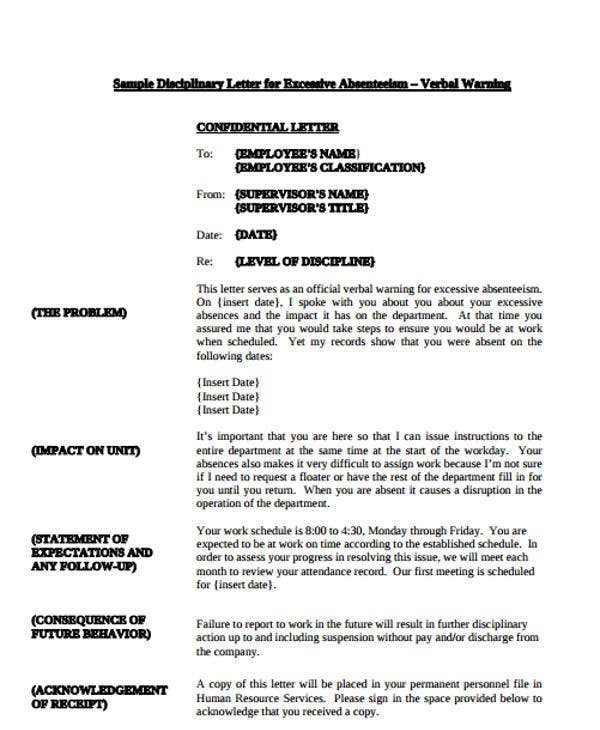 Consequential or Potential Damages – In a warning letter, the employee must understand the gravity of his or her offense. Let him or her know the impact or possible negative effects of his or her actions. Company’s Expectations – The employer will reiterate the salient provisions of the employment contract and what standards are expected from the employee. 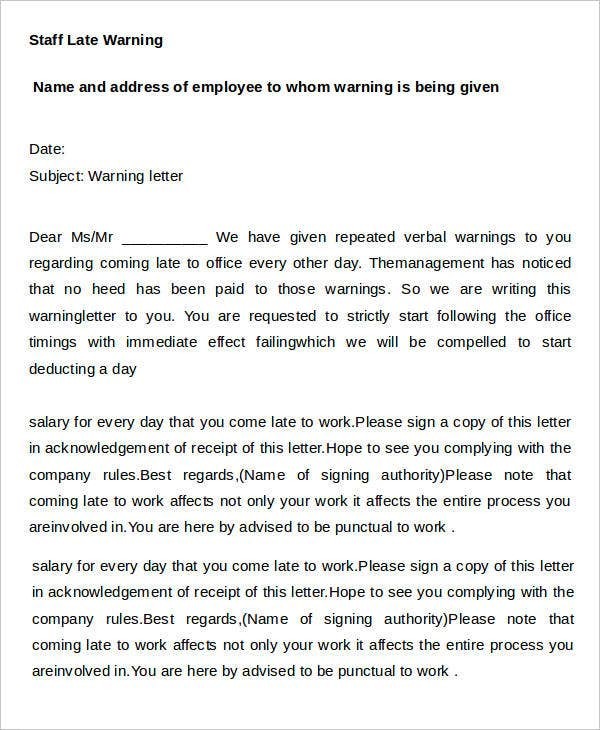 Type of Warning – The letter can serve as an initial, second, third, or final warning which all depends on the policies of the employer. Signature of the Contracting Parties – Ensure that the letter is signed by both the employee and employer. 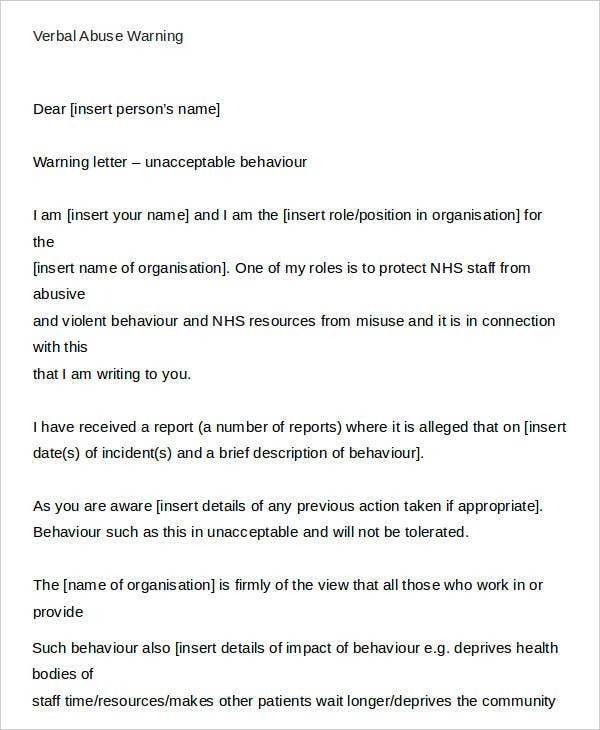 These are some of the essential components of a warning letter. 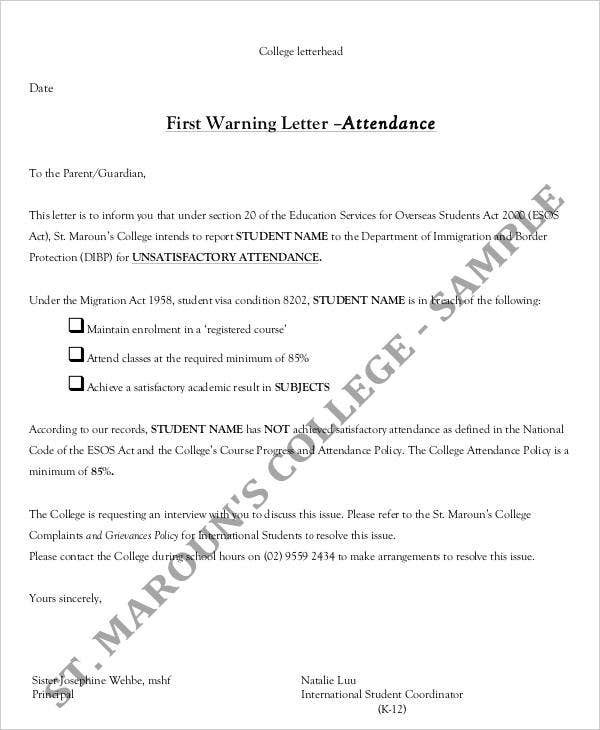 If you’re looking for a final warning letter, we also have templates for you. 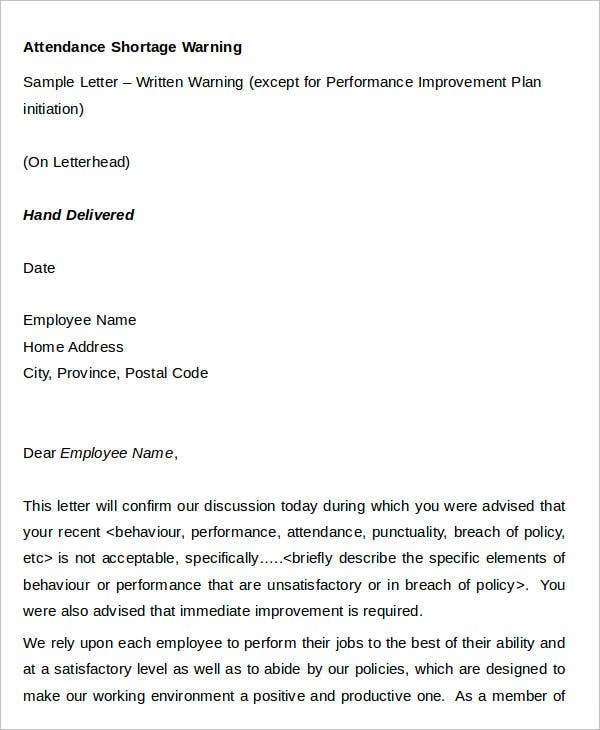 Final Warning Letter Templates – If the employee or staff, fails to respond and act accordingly despite various written warning letters, then a final warning letter will be sent to the employee or staff. 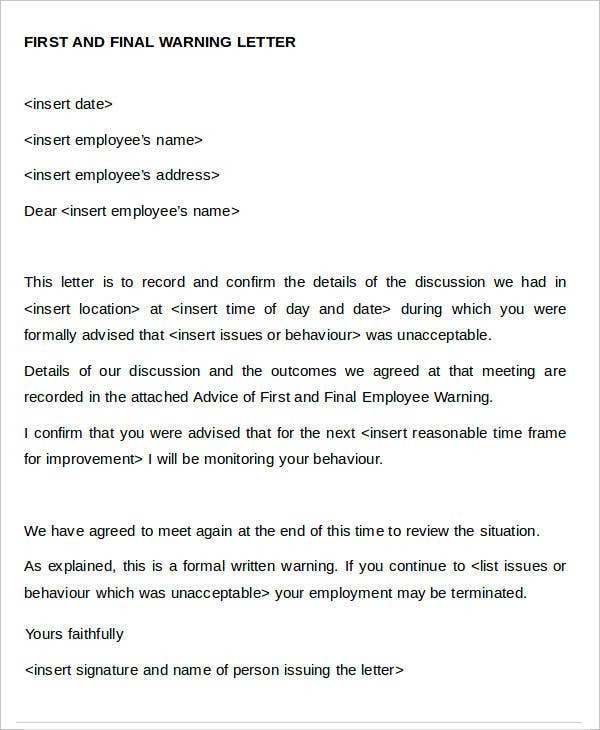 The letter adopts straightforward format outlining the number of times a warning was given, a brief statement about the disciplinary hearing, the consequences of the employees actions, and the actions required by the employer. 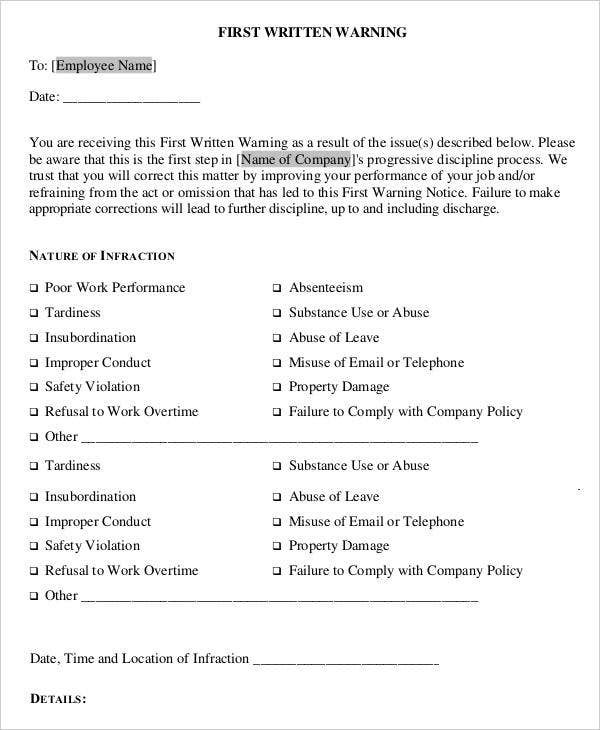 First Warning Letter Templates – This is considered as the initial warning. 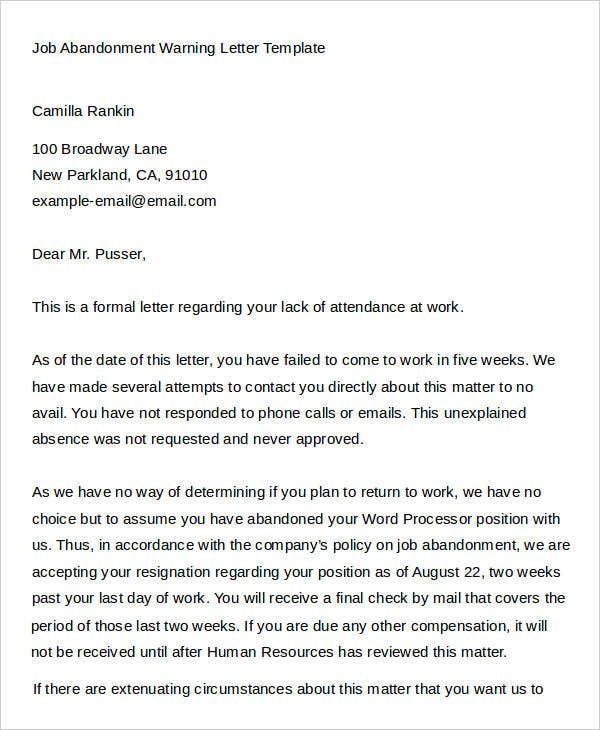 In here, the employee is notified of the employment infractions committed and a statement emphasizing that failure for an employee to make appropriate corrections will lead to further disciplinary actions. 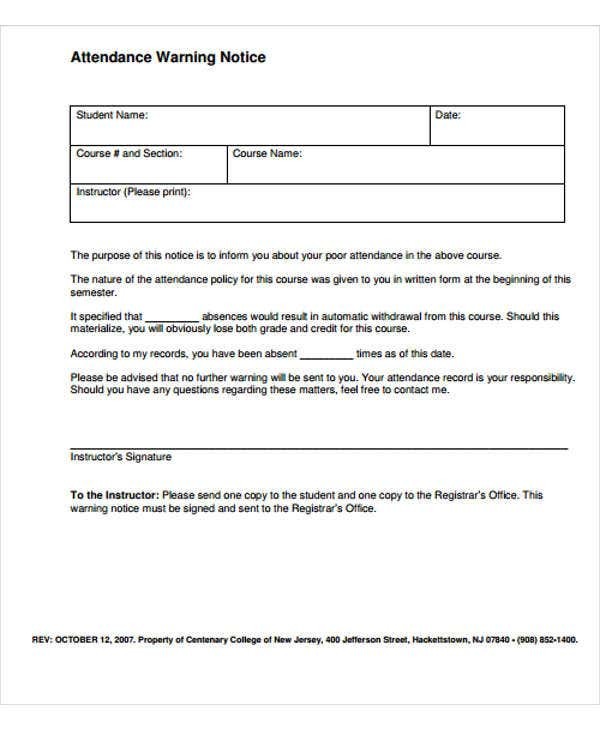 Academic Warning Appeal Letter Template – In contrast to the other letter templates, this template serves as a response made by an addressee of a warning letter. It is an avenue on the student’s end to explain and substantiate that there are just reasons behind the academic and that he or she is will to commit and improve his or her academic diligence. Take note that an appeal letter is relatively brief and at least a page. If you try to examine our academic warning appeal letter, there are key ideas and further guidelines provided for you. 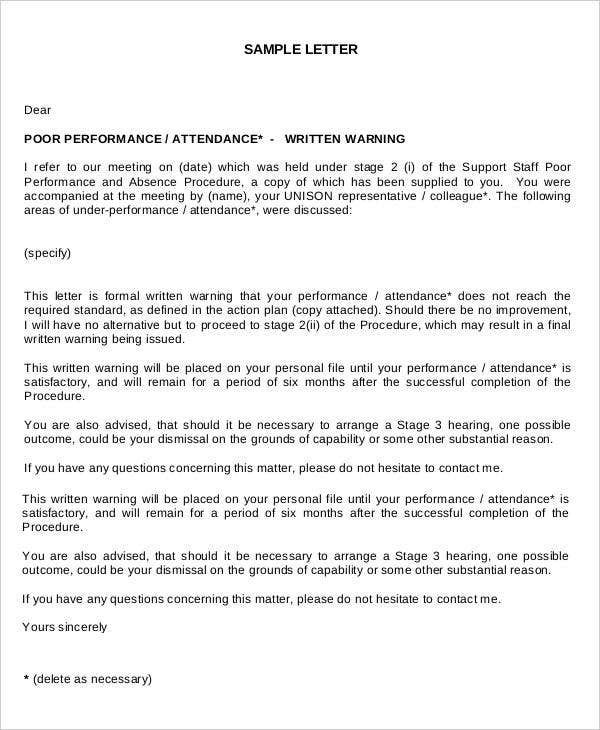 Employee Absence Warning Letter Templates – As mentioned above, absenteeism is a common ground for writing a warning letter. 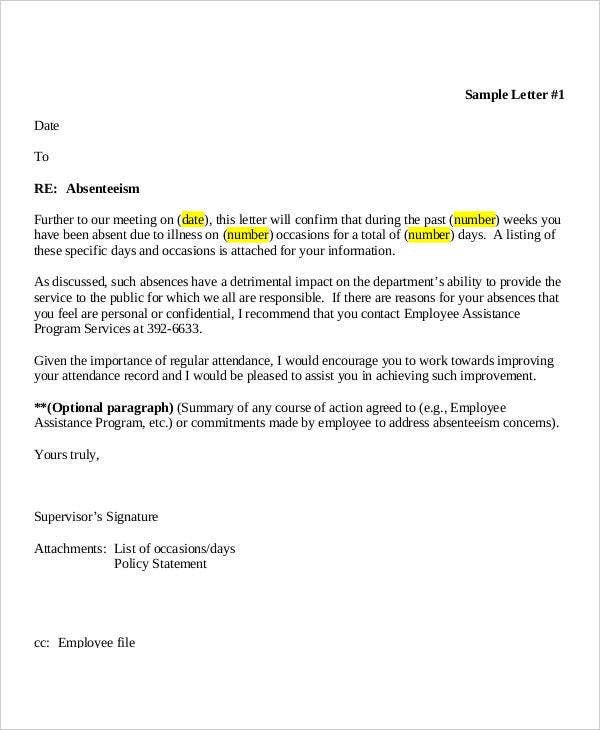 In the actual writing of the letter, emphasize the number of days or weeks that the employee was absent and the corresponding reasons given by the employee. You can also further question the employee about the merits of such reason and to provide supporting documents. 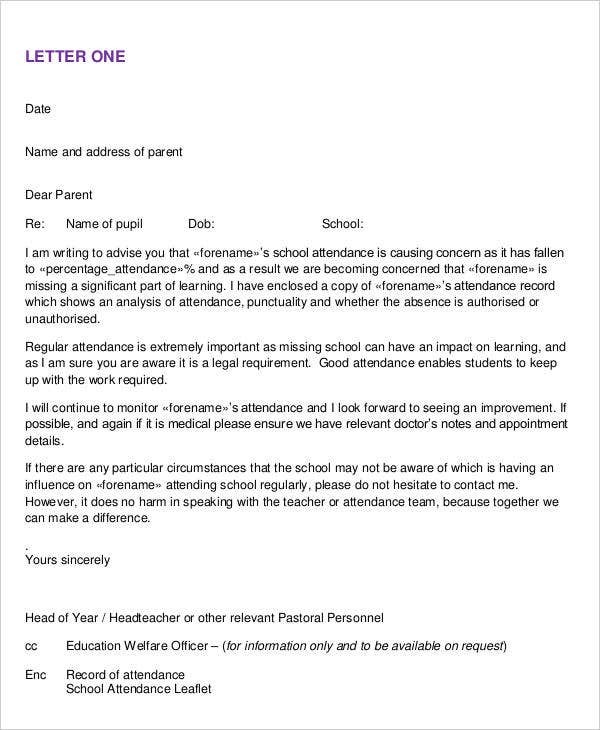 Attendance warning to parents letter templates –As you you may observe, letter of warning is not just solely used for employment purposes. 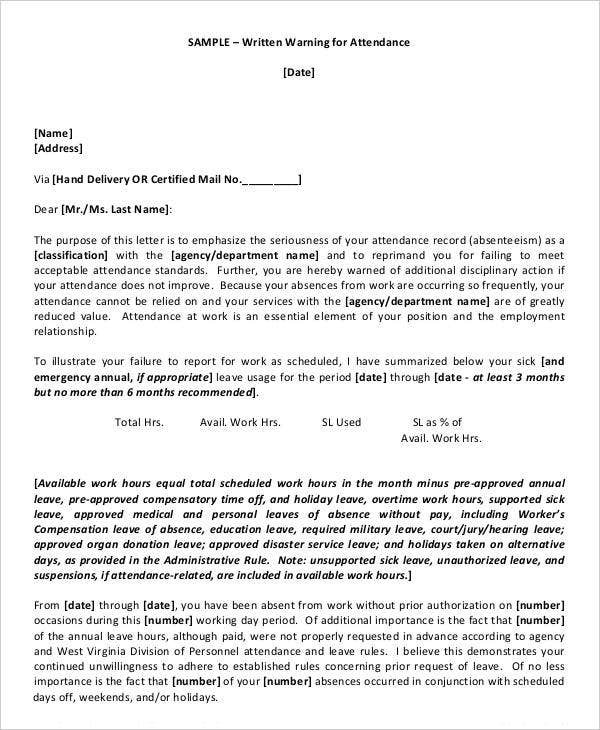 They are also used by teachers and academic heads to notify the parents about the attendance of their children especially regarding recurring absences. In this case, the school is advising the parents that their children may have missed a lot of subjects and discussions because of such absences. 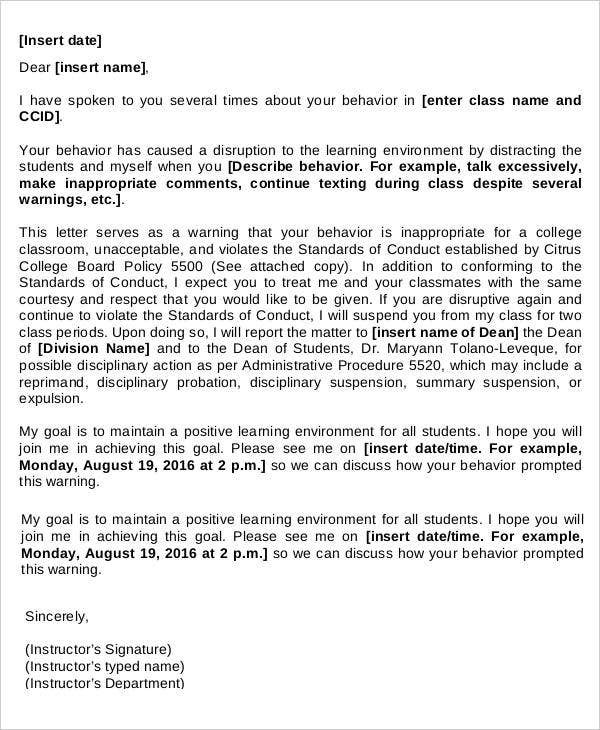 These are some of our featured warning letter templates that you may review and customize. Feel free to use our templates. You have to set the tone of the letter. 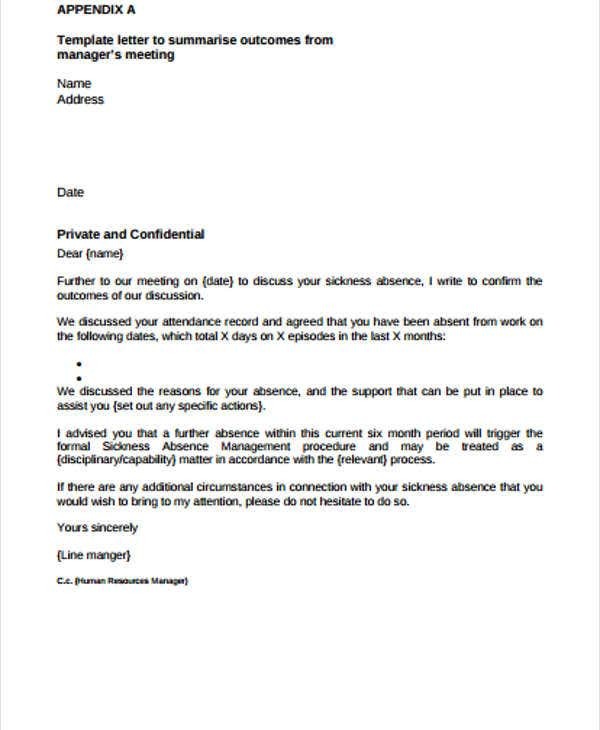 Explain briefly the reason for writing the letter. You need to contextualize the problem and the misconduct committed by the employee, staff, student, or any other personnel. 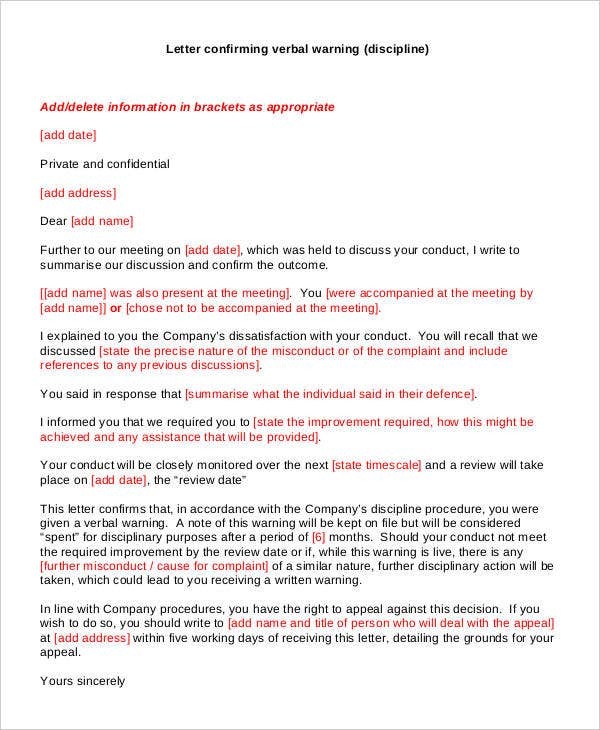 You need to explain the effects of the said misconduct and breaches on the overall welfare of the company. You can be specific if you want. The employee must understand and digest the damages which he or she has caused or will be causing in the future if he or she fails to correct his or her actions. If you’re dealing with students who are regularly absent, you can tell their parents the importance of school attendance and how it affects the grades and behavior of their children. You have to cite pertinent company policies, expectations, or level of performance which the employee must observed. This part here is an opportunity for you to reiterate important policies and standards. Then, you have to make the employee understand that if he or she will not improve or rectify his or her actions, further disciplinary actions will be done. 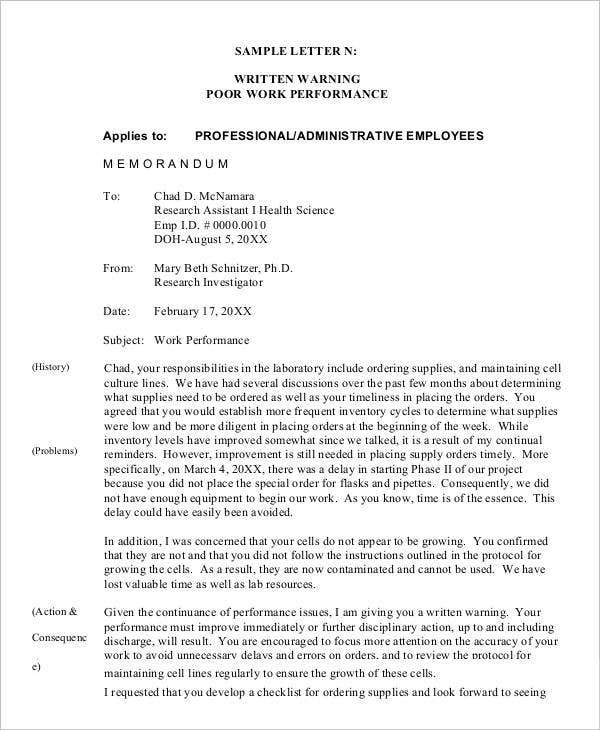 These are some important points in writing a warning letter. It can truly vary depending on your context. However, the templates can help you save your time and effort. Consolidate and organize all relevant documents. 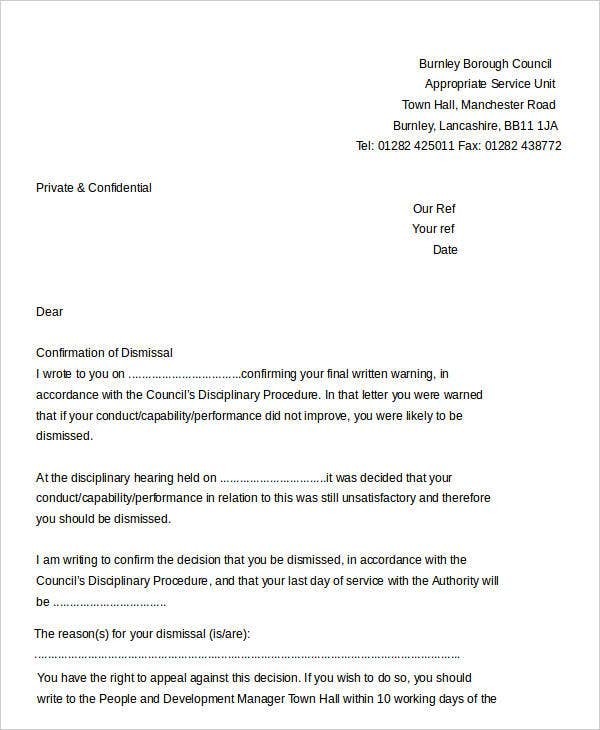 In writing a warning letter, documentation is very important. Bear in mind that you need to substantiate and make the subject person understand the reason for the letter and the facts relating to it. Direct the letter to the proper person. 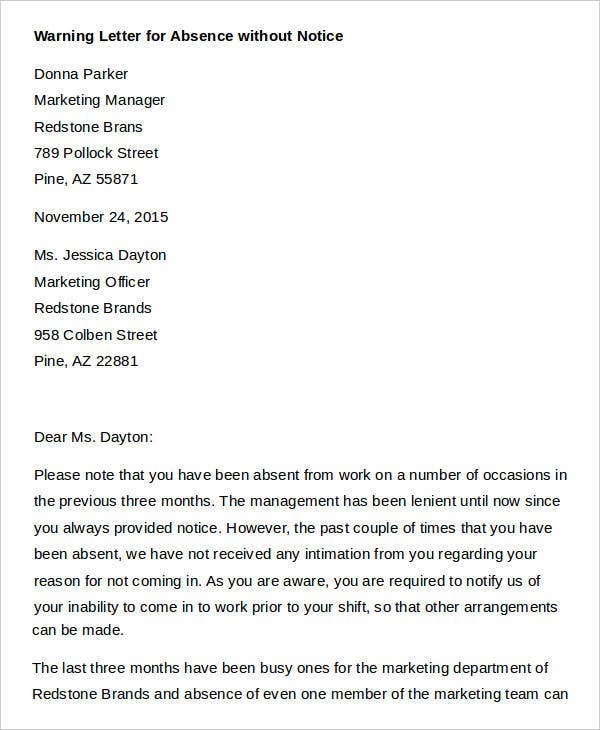 You must directly address and relay the letter to the employee or in other cases to the parents of the student. Be concise, professional, and objective. In writing the letter, don’t be overpowered by your biases and emotions. Be objective and neutral. Give the employee the degree of due process that he or she deserves. Proofread your letter. 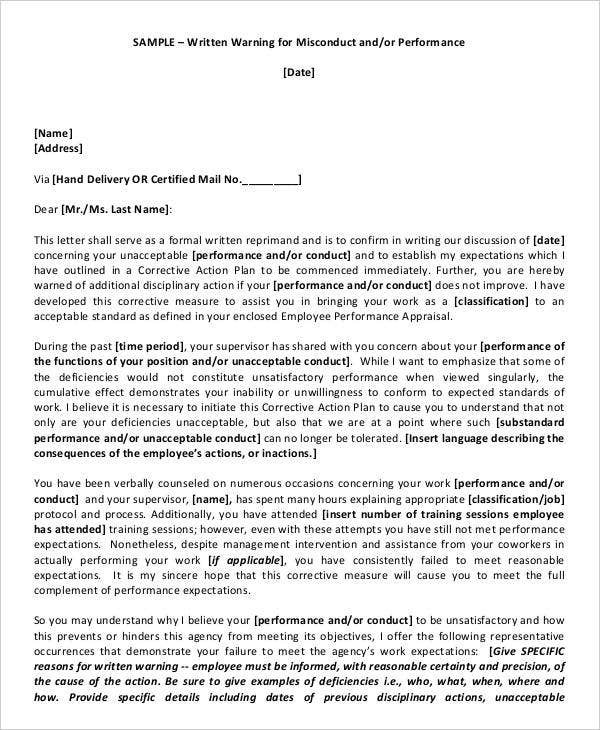 You can let other authorized person to read again your letter for grammar check to uphold the degree of professionalism the letter represents. 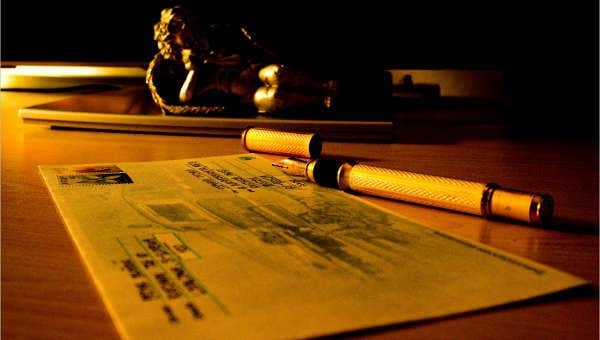 Here are some tips that you may use in writing your warning letter. 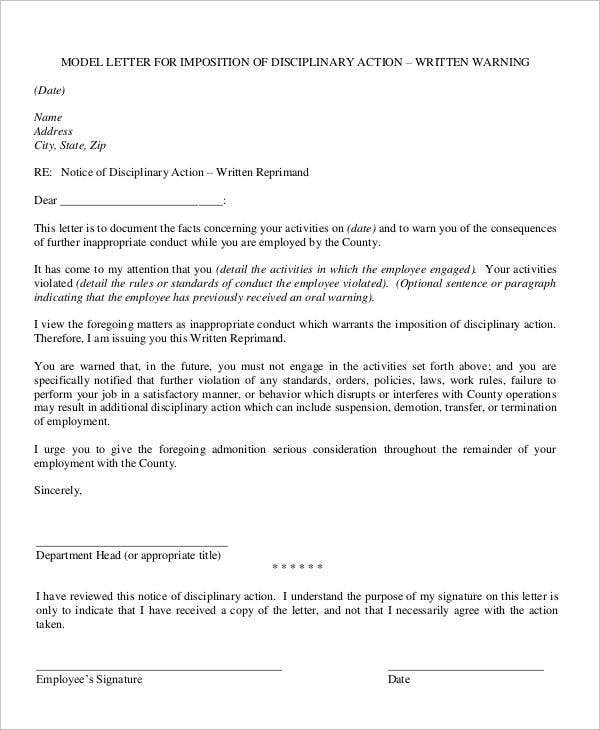 For more examples and HR documents, we also have disapproval letter samples and other HR templates and forms.